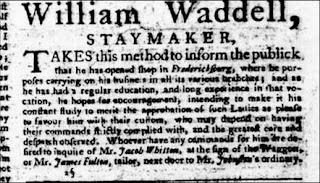 Mr. Waddell takes care to inform the public that he has opened a shop in Fredericksburg. He details his education and experience with the trade, establishing his bona fides to his potential customers. He also ensures prompt delivery, good workmanship and customer satisfaction.